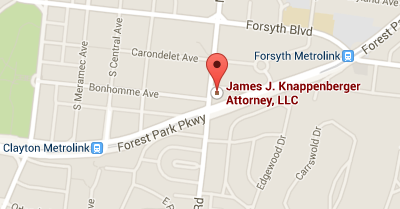 Our law firm is conveniently located just blocks from the St. Louis County Courthouse in Clayton, Missouri. Clayton is a suburb of St. Louis that is just about 20 minutes or less from anywhere in the greater St. Louis area. DISCLAIMER: The information presented in this website by James J. Knappenberger, Attorney, LLC is intended as general information and is not legal advice. You should contact an attorney to learn how the law applies to your specific situation. Use of this form does not create an attorney-client relationship. "Trust in the Lord with all your heart, and do not rely on your own insight. In all your ways acknowledge Him, and he will make straight your paths." "But to all who received him, who believed in his name, he gave power to become children of God"
The information presented in this website by James J. Knappenberger, Attorney, LLC is intended as general information and is not legal advice. You should contact an attorney to learn how the law applies to your specific situation. Use of this web site, communicating through this web site or use of electronic email does not create an attorney-client relationship. Email is not a secure form of communication, please do not send confidential or sensitive information. The choice of a lawyer is an important decision and should not be based solely on advertisements. Neither the Supreme Court of Missouri nor The Missouri Bar reviews or approves certifying organizations or specialist designations. The information in this web site is not guaranteed to be correct, complete, or current. We make no warranty, expressed or implied, about the accuracy or reliability of the information at this website or at any other website to which this site is linked. Images on the site include simulated portrayals of lawyers, clients, scenes and events. The copyrights in all text, images, screens and other materials provided on this Site are owned by James J. Knappenberger, Attorney, LLC, and/or by third parties.